Beloved cult series Mystery Science Theater 3000, about a guy who’s forced to watch bad movies and then riffs on them with his robot pals, looks to be coming back. 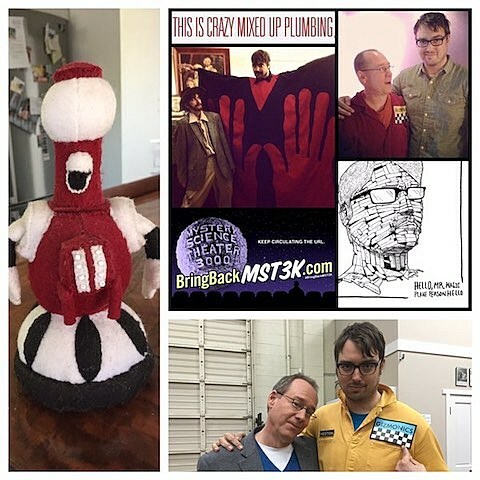 Creator Joel Hodgson launched a “Bring Back MST3K” kickstarter campaign on Tuesday (11/10) with a goal of $2 million to complete three episodes of the show to shop around to networks. One day into the campaign and Hodgson is over halfway towards his goal. The ultimate goal is to raise $5.5 million for an entire 12-episode season. Basically, I’m trying to blend the old with the new,” says Hodgson. “Mystery Science Theater has already refreshed itself once with a completely new cast, so I think it deserves to do that again. The original cast is going to be invited back to write, produce, and do cameos as their mad science characters, and then there’s a new cast with new talent. I can’t really tell you what kind of host Jonah is going to be, but I hope you’ll give him a chance to show you. And even if you’re familiar with Jonah’s career, remember: that doesn’t mean he’ll bring the same exact approach to MST3K. I think a lot of you may be surprised. Plus, like the previous members of our cast, I think Jonah has great instincts and a lot of range. He’s funny, he’s wicked smart, and like I said, his heart’s in the right place. He loves MST3K, he seems to understand what makes it so special, and most important, I know he takes the role seriously. Jonah Ray, meanwhile, says, “I want everybody to know that this show means the world to me and I will do my best for MSTies, because I am one. ” He’s serious, as you can see from the pic above where Ray is dressed as Manos: The Hands of Fate. MST3K got it’s start in 1988 on Minneapolis station KTMA, then went national via the Comedy Channel (which became Comedy Central). Hodgson left in 1993 and head writer Mike Nelson took over as host. The show moved to Sci Fi Channel in 1997 with more cast changes (most notably the loss of Trace Beaulieu, who played both Dr. Clayton Forrester and the voice of Crow) where it ran till 1999. Mike Nelson and some of the other MST3K writers/performers formed Rifftrax, a downloadable movie companion that riffs on current blockbusters; while Hodgson, Beaulieu and others started the similarly riffy Cinematic Titanic. The original MST3K cast recently got back together as part of Tenacious D’s 2015 edition of Festival Supreme.